As we sit back, on a farm just north of Mayenne, at the start of our third night away, the stresses of packing and sorting the house are starting to fade. The word “chilled” could almost start to be used again. 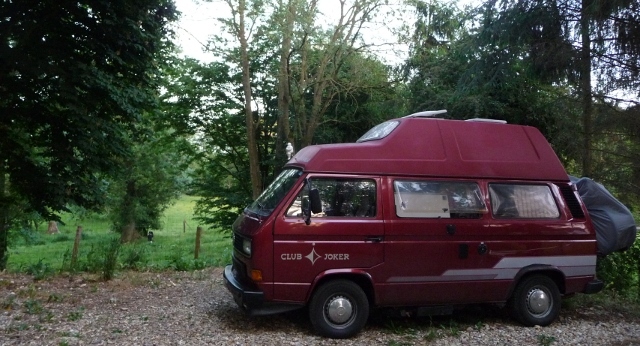 We’re initially heading for the south-west of Brittany, to see a 2cv mate – Jono – who’s working on a camp-site for the summer. After that, towards the south-west and Spain. Probably. Looks like you are well & truly on the way now then Adrian and Ellie. Im following your journey with much interest & have to admit to being a tad jealous! The word “chilled” is one Im looking forward to exploring myself, hope you have an absolute blast, good luck, sure you wont need it though. Living the dream, making the memories, have a wonderful adventure. Totally jealous! I hope to live a somewhat similar dream when the kids all grow up!